You are visitor number Since 10/17/97! 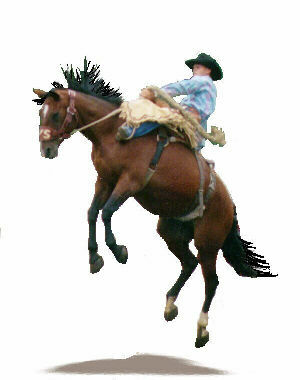 You have discovered the newly developed site for totally FREE home pages exclusively created for rodeo personnel of all types. We have a few submissions to start with, but expect much more! Please feel free to browse these home pages and don't be afraid to contact us regarding development of your own web page FREE! CLICK ON THE WEB PAGE LISTED BELOW THAT YOU WOULD LIKE TO BROWSE! Dirty Annie's Country Store Want a link to your site from mine? Click Here. To have your web page developed for you, or if you would like a link to your already existing page, please contact us by either sending the information by mail to: River Valley Creations 10 Anne Street Mazomanie, WI 53560 OR CALL (608) 795-4899 in the evenings OR US! Want to join the The Rodeo Ring? 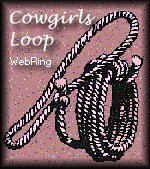 This Cowgirls Loop WebRing site is owned by PRO RODEO HOME PAGES Prev | Skip | Next 5 | Random | Next | List Want to get your cowgirl site in the Loop? Prev Site | Random Site | Next Site Quarter Horse WebRing Index of Sites Want to add your Quarter Horse site? Click to join Cowboys-n-Cowgirls ring ! Want to join the Friends Of Rodeo Ring? scripts, or use them on CGI Free's server, for quick and simple access.